In the last game before the All-Star break, the Reds look to finish the unofficial first half of the season with a three game sweep of the Cardinals at Busch Stadium.Ã‚Â First pitch is at 2:15 ET. If the Reds win today, their record will be 44-52 at the break. If they lose, the record will be 43-53. 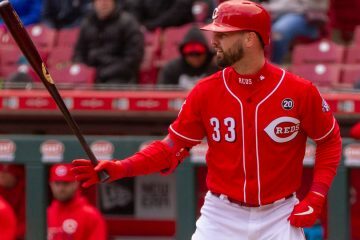 The Reds will take either record considering the horrendous April start. Anthony DeSclafani’s been decent enough since he came back from the disabled list in early June, but his last outing was his best. Against the Cleveland Indians on July 9, he pitched seven innings of five hit, one run baseball. That one run came on a solo home run. He only struck out three, but was able to get batters out in other ways. Like Luis Castillo, DeSclafani has also had issues with giving up the home run ball. He’s surrendered 10 home runs in 40.2 innings, and his HR/9 is at 2.21. However, he’s pitched at GABP for all but two of his starts, so that plays as a factor as well. Most important for DeSclafani though is to pitch every fifth day, stay healthy, and get himself back to the pitcher he was in 2016. 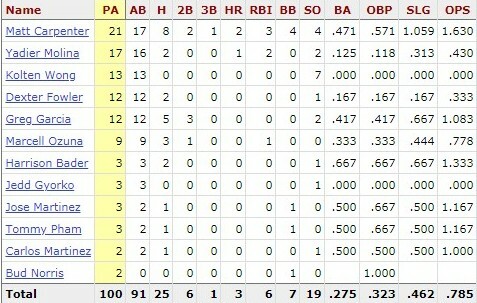 Matt Carpenter has the best numbers against DeSclafani, with eight hits in 17 at-bats, including two home runs. Miles Mikolas might just be the best comeback story of the year. After two years with the Padres and one with the Rangers (from which he was released), Mikolas went to Japan to pitch for the Yomiuri Giants, where he turned around his career. In 62 starts, he pitched to a 2.18 ERA. The Cardinals signed him in December 2017, and he’s been the best Cardinals pitcher this season. In 18 starts, Mikolas has a 2.65 ERA and a 3.21 FIP. His success stems from not giving up home runs and not walking people. He’s walked the same number of batters (18) and given up the same number of home runs (8) as he did when he was with the Texas Rangers in double the number of innings. He was deservedly named to the National League All-Star team, but will not pitch since he’s pitching today. Mikolas is a ground ball pitcher–he induces about 50.4% of them–and uses his sinker and slider almost as much as his fastball to do so. His velocity ranges from upper 80s to mid-90s, so he relies on locating pitches well in order to have success. The Reds have limited at-bats off Mikolas, but Tucker Barnhart does have a home run off him and Scooter Gennett is 2-for-6 against him. The lineups can be found here. With multiple rain delays yesterday, both bullpens have been used more than the teams would have wanted to. 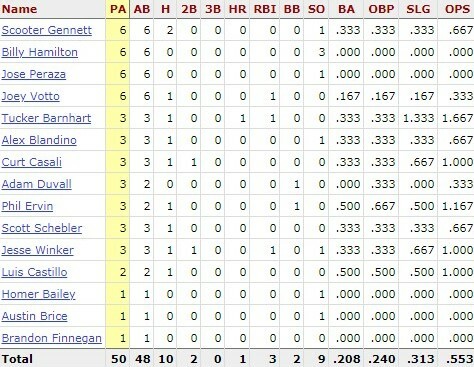 The Reds look to be in better shape than the Cardinals though, as they only used five pitchers last night to St. Louis’ seven. However, with the All-Star break coming tomorrow, don’t be surprised if nearly everyone is available. -I’m not saying the Reds got Mike Matheny fired, but I think they got Mike Matheny fired. -Good news for Scott Schebler. The All-Star break comes at a good time. Hopefully with the next five days off, he’ll be ready to go come Friday. -Here’s the lineup for the Futures game today. Hunter Greene and Taylor Trammell won’t start, but will likely play at some point, especially Greene. Lineups and starting pitchers for today's Futures Game in D.C. It's Keller vs. Luzardo. The Futures game will be played in DC this afternoon at 4:00 ET. If you get a chance, I highly recommend watching it. It’s a great way to watch players who will likely be playing at the major league level in the next couple of years. Many of the MLB stars now played in the Futures game once, including Joey Votto. Many of the players you won’t know now, but in a couple of years, you’ll hear a name of a player and say “I know that name. He played in the Futures game once.” In 2015, I went to the Futures game at GABP and it was a blast to watch. And now, I’m watching baseball games and recognizing players who I saw then, such as Michael Conforto, Lucas Giolito, Trevor Story, Ketel Marte, Blake Snell, Aaron Nola and Amir Garrett. And that list doesn’t include stars like Aaron Judge, Kyle Schwarber, and Ozzie Albies. The Futures game really is a great event. The only problem with it is that it’s played while MLB games are happening. Very interesting game this afternoon, on one hand Reds will look to sweep the Cards and the 1st half in a higher note, on the other hand Cards will do anything to do not be embarrased, specially their new Manager. Good pitching match up. Until the Reds get to the Cards bullpen. My dislike for the Devil Magic Cardinals comes from respect. Cardinals still have a 25% chance of making playoffs, still have a Top 10 SP staff by WAR, and most importantly, have the resources and winning standards to correct further mistakes, if changing managers doesn’t work. Both rookie STL SPs, Jack Flaherty and Luke Weaver have more WAR than Castillo and Mahle do combined. Let’s hope for a sweep to go into the All-Star Break on a high, but if this is “sky is falling” in STL, the Reds and Cardinals still operate in separate universes. Just to be cranky, I’ll add this: If Schebler isn’t ready to play immediately after the break, I’m going to be disappointed that the Reds didn’t DL him, especially when about half of the 10 days would fall when the team isn’t playing any games. 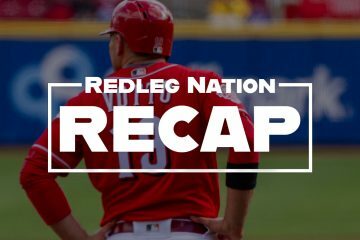 … At the least the Reds could’ve had an extra bench bat Sunday, and maybe for a few games after the break. I don’t like it when they play a man short needlessly. Maybe they’ll get a better evaluation in a day or two. They can backdate the DL move by a few days. Before this road trip started, I said if the Reds go 4-5 I would consider that a successful road trip. Now I want 6-3, sweep the stinking Cardinals! And with any semblance of a bullpen in Chicago, shoulda coulda been 7 or 8 wins. April is so, so far away. Reds and Cards looking for manager at yrs end. So it begs the question: all things considered, which is the better job next yr and the immediate future? Where would a candidate rather manage? Cincy or StL? I would still stay Cardinals because they have a track record of getting things back together quickly and as noted above by SLIAOTAR, their owner doesn’t meddle in baseball decisions. I don’t think the Cards wait till the end of the season. They still have a shot this year and I think Cards ownership will want to a new set of eyes on this team as soon as possible so that ownership can go out and get better players after the season is done. I’m glad they have their A lineup today (besides Schebler). The Cards will be hungry today and Desclafani will be tested early I think. Duvall’s only offensive value is his power and Riggleman has him hitting behind Barnhart and in front of the pitcher. From the Old Cossack’s perspective that’s as much as Riggleman can bury him in the lineup and still have him in the lineup. So what do you all think of m so what do you all think of the AB per SO stat? Not a fan of AB/SO as an effective data set. I’d much rather utilize SO%, BB% & OBP than AB/SO. Contact rates and hard/non-soft contact are also more important than SO. I agree with you. I havenÃ¢â‚¬â„¢t seen it as a statistic in a while and now IÃ¢â‚¬â„¢ve seen it referenced a couple of times in the last week. I was wondering if it had gain some new significance? 24 pitches to 4 batters. No hits, either. Anyone could’ve had Mikolas. That stinks because he’s pretty good! I think it was WV that was talking about him over the winter and then the Cards got him for 2 years at 15.5mil. Disco better get on it today because 3-4 runs might put it away. I like his presence on the mound. I canÃ¢â‚¬â„¢t quite say what it is, but he really looks like a major-league pitcher. Disco squeezed on first pitch. No matter how hurt that guy was he make sure he was going to get back to the bag. He just keeps getting on….. I think it was George&Drew pointed out that he does his best work as a lead off hitter. I wanted him batting in front of the pitcher. There goes the no-hitter. LetÃ¢â‚¬â„¢s work on the shut out. Peraza needs to try to pick out a slow curve and steal 2nd! He throws a ton of them….take a shot! #&&#$’n Riggleman? Lovessssss the bunt but won’t hit-n-run if you put a gun to his head. I hope the Reds keep winning but bite the bullet and send him on his way with a nice thank-you note! The 25 man roster strikes again. Schebler hurt… Duvall steps in… Winker rips a ball. Duvall and Ervin could be solid 4/5th outfielders and cheap. Trade Scooter. Put Senzel at 2b….get Starting pitching. Keep Iglesias and Hughes. How often it happens. The pitcher is involved in the offense and then the next half inning the opposition scores. It’s time for the NL to get with it and join the AL with the designated hitter. Yeah…I’ve noticed a ton this year. Both for the Reds and against them. Disco has to be better then that though? Although if Pham’s ball is about 8 inches to the left then its 6-4-3 and no runs. I recall one October game with a ball that was inches away from changing the outcome. And Angel Pagan had to make a decent play to snag that one. The only place where it shouldn’t be a game of inches is the strike zone. What I saw again today was terrible … and it cut both ways. Batting and running the bases is part of the game. Have no interest in seeing the DH in the NL. Dont understand why Romano is first out of the pen. With Homer as starter having Romano for 3 innings and Lorenzo for 3 innings to clean up Homer’s mess might just work. A version of Tampa. Probably the role he will eventually settle into. It might not be their day? Duvall misses a granny by about a foot. Scooter barely misses a 2 run HR in the first. Billy got a hanging breaking ball with the bases loaded and popped up. It happens. See if they put some pressure on their pen. They’ve been horrible. Yeah I think you’re right. Gant seems to have their number today. I’m going outside to mow. Shake things up a bit. Hope it works and the Reds rally. On to the break for some rest and lets start a new streak Friday.Go Reds. One thing about Joey Votto and he has a bunch of things we could talk about and 99% of them are positive is he never ever gives an at bat away he battles regardless.A true pro and in this day in time a true pro every day and in every way is rare. “Only” 8 hits today … and 3 of them by Peraza. I’m happy at a 5-4 road trip (less so knowing we could have at least 1 more against the Stupid Cubs). From what I’m reading, the Cards are now playing for their current existence. I wonder if the threat to blow them up is real? Have a great break, y’all. See you on the dark side of the moon. Surprisingly, I’m a bit disappointed by the 5-4 road trip record. I would have taken that record in a heartbeat before the trip began. I’m beginning to expect them to win, even against teams with winning records, so to drop the finale is a bit of a downer — especially how poorly DeSclafani pitched. I hear you Tom. I’m kind of mitigating my emotions with the near-sure knowledge that we’re not going to the post-season this year. I’m hoping we get some value for traded personnel in the next few weeks. Still 2 of 3 against both the Tribe and Birds is a happy feeling. We “Cubbed” in Wrigley … no doubt about that. These guys never give up — keep battling until the final out. As someone who was fortunate enough to watch and listen to the Big Red Machine games, this current team gives me a similar feeling — don’t give up on them until it’s over. Yeah, I notice I’m watching the whole game the last couple weeks as if I’m actually expecting a good outcome. I’m scratching my head a little, what with Joey 1st pitch swinging in that AB. But others will note that Riggleman didn’t have Votto bunting in that situation.